Four years ago Qian Zhijun's teacher loaded a picture of him onto the internet. Now a gas station attendant in Beijing, China, Qian has become a household name. 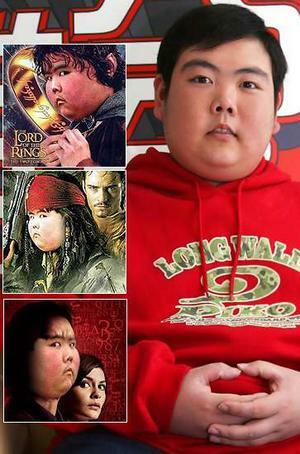 Someone surfing the web found Qian's picture, and liking his unique facial expression, decided to drop his face onto some popular movie posters. Having replaced Tom Hanks, Johnny Depp, and even Jake Gyllenhaal on a "Brokeback Mountain" poster, Qian has become one of China's most famous internet celebrities. Nicknamed "Little Fatty", Qian was initially hurt by the teasing, but has fallen into the groove saying, "...my feeling has changed. If you always feel depressed, then you feel uncomfortable. Now I can view this event with a calm mind, and I feel released". He hopes to parlay his internet fame into a career in entertainment, maybe even a cooking show. Being that the GTB often engages in a bit of photoshopping it is nice to think that maybe someday, our digital prowess might make someone famous. It is incredibly unlikely that that someone will be us.